China: N. Guangxi province. 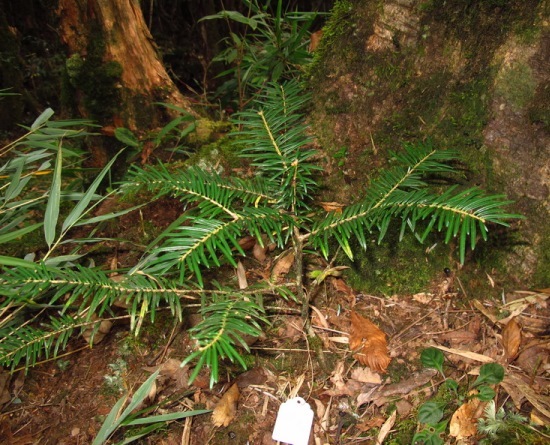 A relatively recently discovered species confined to Yuanbao Shan in Rongshui Xian county which is outside the general range of Abies species. The whole population is within an area of 4ha. The population is estimated to number 589 plants and the population structure is skewed to old (senescent) individuals and young ones, with very few middle-aged plants. The highest mountains in Guangxi, like Yuanbao Shan, have a very cool, wet climate, with annual precipitation exceeding 2000mm. The summers are cool and cloudy, the winters last four to five months and bring abundant snow from December through March. 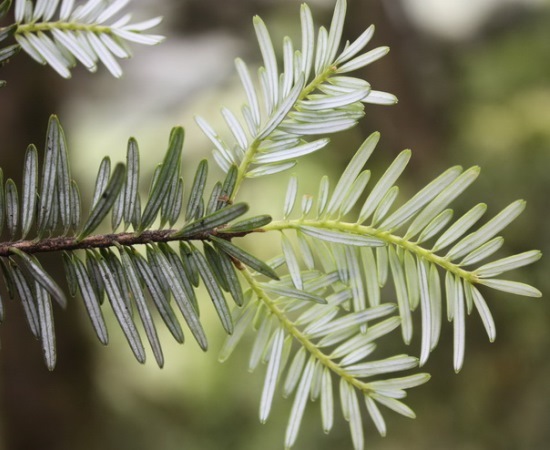 This species occurs in mixed deciduous-coniferous forest with other conifers (e.g., Tsuga chinensis) and broad-leaved trees dominated by members of the Fagaceae; the Abies trees are very scattered. 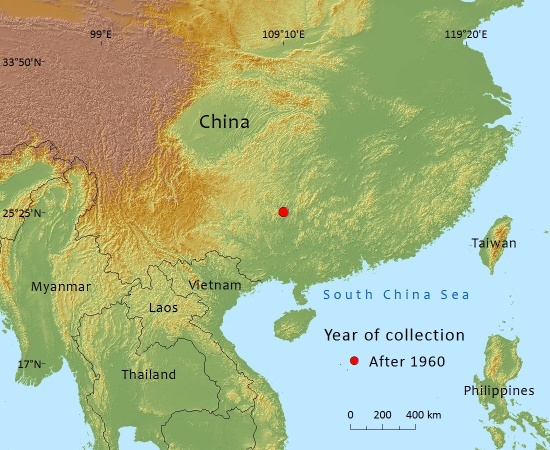 Abies yuanbaoshanensis is assessed as Critically Endangered due to its very restricted distribution and a continuing decline in mature individuals. There is a need for ex-situ conservation and for research on the measures required to prevent it from going extinct. This species has an extremely limited distribution, distant from other species, and is only known from one small area in Guangxi Province. The population was impacted by a severe winter in 2008 and a number of trees died. The population occurs within a protected area. Further research is required into this species’ threats and what measures should be taken to rescue this species from going extinct. 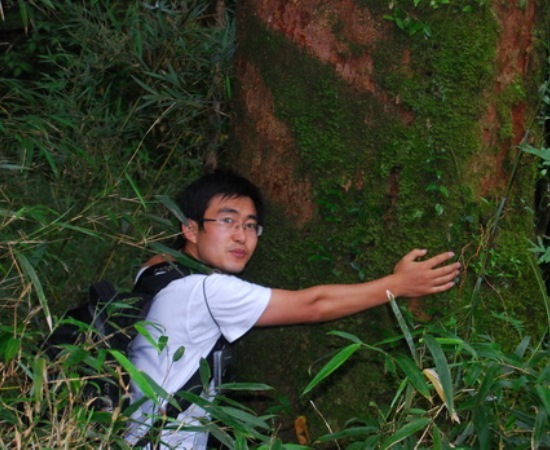 There is a need for ex-situ conservation. Fu, L., Lu, Y. & Mo, S. (1980). 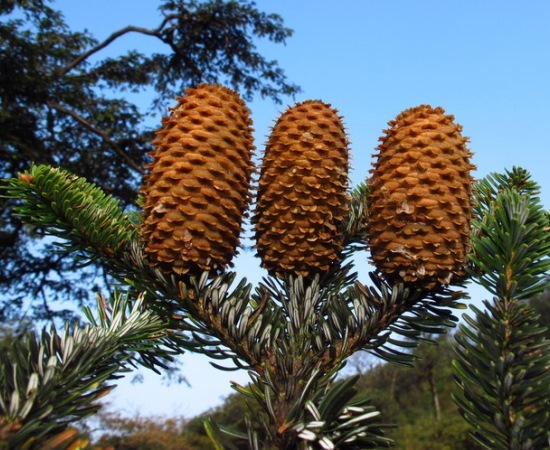 The genus Abies discovered for the first time in Guangxi and Hunan. 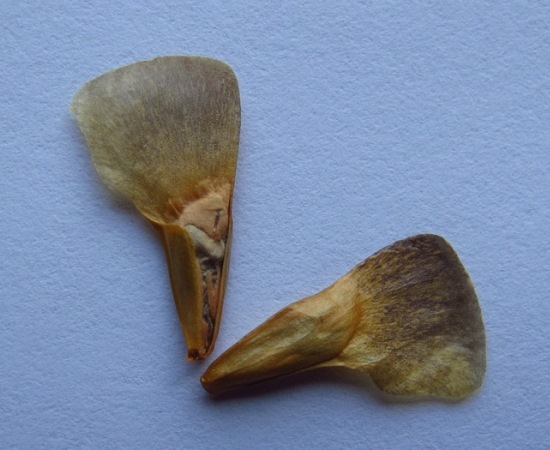 Acta Phytotaxonomica Sinica 18(2): 205. 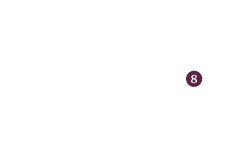 Farjon, A., Li, J.-y., Li, N., Li, Y., Carter, G., Katsuki, T., Liao, W., Luscombe, D, Qin, H.-n., Rao, L.-b., Rushforth, K., Yang, Y., Yu, S., Xiang, Q. & Zhang, D 2011. Abies yuanbaoshanensis. In: IUCN 2012. IUCN Red List of Threatened Species. Version 2012.2. . Downloaded on 05 April 2013. A.Farjon,J.-y.Li ,N.Li ,Y.Li ,G.Carter,T.Katsuki ,W. Liao ,D.Luscombe ,H.-n.Qin,L.-b. Rao ,K.Rushforth ,Y.Yang ,S.Yu ,Q.Xiang,and D.Zhang, 2015. Abies yuanbaoshanensis, from the website, Threatened Conifers of The World (http://threatenedconifers.rbge.org.uk/taxa/details/1013).